Click here for handy resources (including an online dictionary), information, games , community and activities. Click here to visit a great resource hub for Esperanto teachers, once your Esperanto is up to speed! This course is available in a wide range of languages to welcome new speakers from everywhere. Information about Esperanto in English. The biggest collection of Esperanto computer games in one place. Vinilkosmo is an independent record label situated near Toulouse in the south of France. 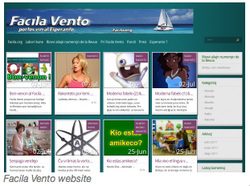 Facila Vento is a new site producing new easy-to-read Esperanto texts to help beginners get comfortable in the language. Fun stuff about Esperanto and languages in general. This is a great way to learn and practice with a good choice of voices to listen to. It keeps you on track in a nice, friendly way too. 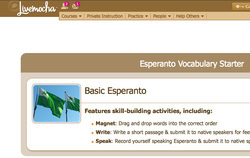 Click here to see how Esperanto serves the British National Curriculum. Click here to learn more about Esperanto, the national body, summerschool, courses, forums and local clubs. Asia Literacy Teachers Association of Aus.